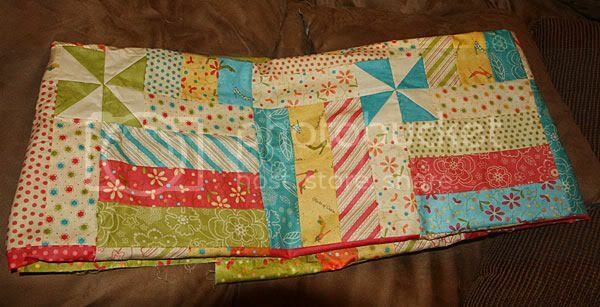 I finished this top a while back and it's been folded up in my cabinet, waiting to be quilted. I was going to wait and post it when it's done but that might be a while at this rate. I used an Objects of Desire jelly roll by Sandy Gervais from Moda. I love this line! I got the pattern from an American Patchwork and Quilting magazine and used Electric Quilt to figure out my color placement. I love how the pinwheels were formed-each block is just 3 longer strips and one shorter strip with a half square triangle on the end. When the blocks are assembled the half square triangles come together to make the pinwheels. Cool! I apologize for the less-than-perfect pic. The top is a bit wrinkled from being folded up and it is really hard to take good pics in my living room for some reason. I'm going to commit to taking pictures during the day and possibly outside from now on. Obviously this is just a portion of the quilt. I'll share the whole thing when I get it quilted. Looks great!! Way to go! Now, that's pretty! I can't wait to see if all finished! I swear you make me want to quilt! Oooh I can see why you love that fabric so much. It's beautiful! I love just about anything that Moda makes. They just have the yummiest fabrics. Can you imagine if they made paper? Beautiful! I can't wait to see the whole quilt spread out! You do such great projects! I LOVE these colors together!! This is so pretty, Gale! !